I have absolutely no real justification for reviewing this book here at The Children's War except that I read it, I loved, I can't believe I waited this long to read a Flavia de Luce novel, and if I really want to push the envelope, I could say it is a nice post-war mystery. But I am reviewing it mostly because I am participating in the 2014 Crusin' with the Cozies Reading Challenge and didn't have a true WWII mystery on hand. Speaking From Among the Bones begins in Spring 1951 and the rural English village of Bishop's Lacey is still trying to recover from the war. Now, it is about to celebrate the 500th anniversary of the death of St. Tankred, their patron saint and the namesake of the villages CofE church, where he is buried. And to celebrate, the saint is going to be exhumed from his tomb. Naturally, Flavia de Luce, 11, amateur sleuth, is very curious to see the body of the saint when the tomb is open. But before that happens, the church organist goes missing and Flavia's older sister, Feeley (short for Ophelia) is called in to substitute until he returns. But Feeley has been complaining that the organ has been sounding wonky lately. When Flavia shows up at the church to investigate the wonky sound in the organ, she arrives just in time for the exhumation. Naturally, she sticks around. So, when St. Tankred's tomb won't open easily, it is Flavia who is the only one small enough to crawl in to see why it is stuck. And what she finds is the organist, Mr. Collicott, dead and wearing an old wartime gas mask. But who and why would anyone want to kill someone as ordinary as a church organist. At the same time that Flavia is working on the mystery of Mr. Collicott's murder, things in her own life have become very unstable, and there is a good chance she could lose her beloved first-rate chemistry lab and library left by her Uncle Tar. The de Luce's live in an enormous old manor called Buckshaw, left to Flavia's mother, Harriet. Flavia lived in the west wing, while her father, sister Feeley and Daffy live in the east wing. Harriet has been missing for years now after a skiing accident in the Alps when Flavia was a baby, and the government is bleeding her father financially dry with inheritance taxes, which has caused him to sink into a severe depression" "…His Majesty's Board of Inland Revenue had done to Father what the Empire of Japan had failed to do. They had caused him to give up hope." Of course, things get more and more complicated as Flavia goes around on her bicycle named Gladys, trying to piece together the mystery of Mr. Collicut's murder, and trying to ignore all the problems at home. And along the way, she discovers some information about her missing mother's past. There are also real some other surprises in store for Flavia, but none like the one at the end of the book. I enjoyed reading this book so much, so why, oh why did I wait so long to get to know Flavia? An 11 year old who loves chemistry, poisons being her speciality. Talk about intelligent, eccentric and precocious, a natural born busy-body, and yet so likable. Totally appealing to a girl who cut her mystery reading teeth on Nancy Drew and moved on from there. 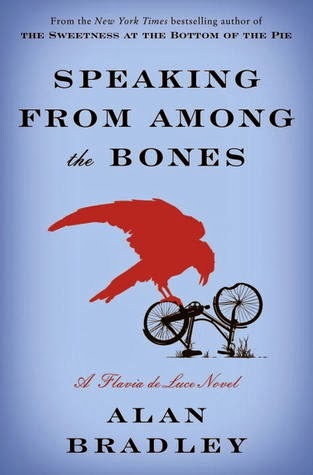 Speaking From Among the Bones is the 5th Flavia mystery in the series. Amazingly enough, it really stands alone. The author, Alan Bradley, has managed to write a book that includes just enough information about the past so that you can go back and read the other four novels without having had them spoiled, yet you have enough background to understand this book. And although the Flavia mysteries are marketed as adult books, they are the kind of mystery that has a great deal of teen-appeal, and maybe even some precocius pre-teens would enjoy them. I liked Speaking From Among the Bones so much, that I immediately bought the first 4 novels to catch up (I already have Number 6 on my e-reader, thanks to NetGalley) and I have never ever done that before. I think that with the exception of the Dorothy Sayer's Peter Wimsey mysteries, the Flavia de Luce mysteries are English eccentricity at its finest. I have read all these books except for the new release, which I definitely will be reading. 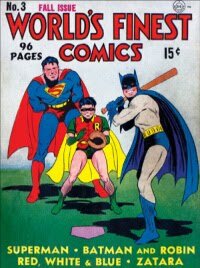 You're right, they're fantastic. I don't understand why I don't see these books on lists of adult books recommended for young readers. I know, I don't know why they aren't on lists like that either, there are so many fans of Flavia out there. loved it and can't wait to read them all.